To switch to an Oracle database, install Oracle and follow the steps below. When they are used together, Fisheye and Crucible share the same external database. Oracle support for Fisheye/Crucible and Crucible was introduced in version 2.5.0. In order to migrate to Oracle, your instance must be currently running at least version 2.5. If you are running an older version, then you will be required to first upgrade Fisheye/Crucible and then migrate. The JDBC drivers for Oracle are bundled with Fisheye/Crucible. Skip to step 2 if this meets your needs. If you want to install a specific, different version of the bundled JDBC driver, download the Oracle JDBC driver .jar file from the Oracle website (http://www.oracle.com/technetwork/database/features/jdbc/index-091264.html) and copy the .jar file to your FISHEYE_INST/lib directory (create the lib/ directory if it doesn't already exist). Move the existing JDBC .jar file to another location (and back it up). Restart Fisheye/Crucible to have it pick up the new driver. Because creating a database with Oracle is a complex process, we recommend speaking to your resident DBA for creation of a new database for usage with Fisheye/Crucible. We highly recommend installing Oracle with the AL32UTF8 encoding otherwise you may see encoding issues in the product. Ensure the database user has CREATE TABLE, CREATE SEQUENCE and CREATE TRIGGER permissions in addition to the read/write permissions to the database. Then choose Edit > Test Connection to verify that Fisheye/Crucible can log in to the database. Fill in the appropriate fields, replacing the host, port, database name, username and password using the same connection details as used when creating the Oracle database in Step 1 above. If this fails, verify that you have the Oracle JDBC driver .jar file in the classpath (by placing the .jar file in FISHEYE_INST/lib). Also, ensure that the database user can log in to the database from the machine that Fisheye/Crucible is running on and that all the required privileges are present. Click Save & Migrate Data to start the migration process. During the migration process (which will take several minutes, depending on the size of your database and network throughput), the product will be inaccessible to users and external API clients. Users will see a maintenance screen that informs them of the process. Should the migration fail for any reason, Fisheye/Crucible will not switch to the new database and report on the encountered problems. Because the destination database may now contain some, but not yet all data, drop all tables, indexes and constraints before attempting a new migration. 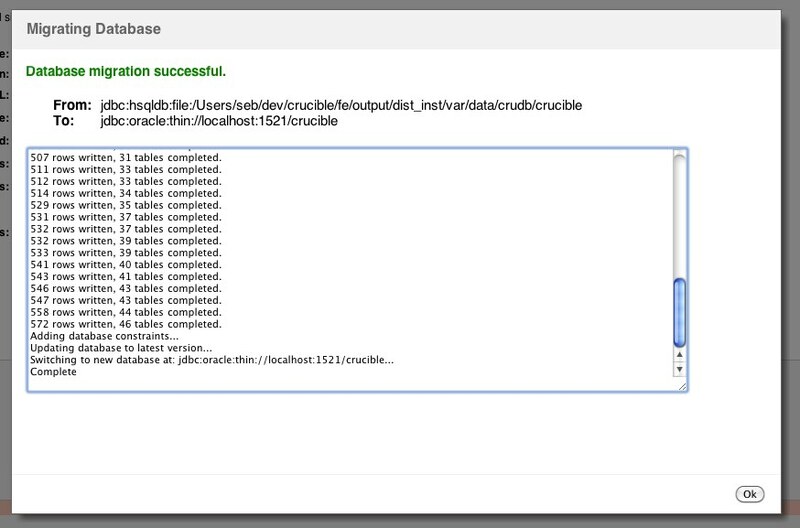 When the import is complete, Fisheye/Crucible can be started and will use Oracle.